Through testing conducted by an independent, U.S. EPA-certified laboratory, it was determined that Adya, Inc.’s water purifying solution, Adya Clarity, reduces up to 99.9% of the chemical 4-Methylcyclohexanemethanol (MCHM) from water. The chemical, 4-Methylcyclohexanemethanol (MCHM) was spilled into the Elk River just upstream from the Kanawha County municipal water intake in Charleston, West Virginia on January 9, 2014, contaminating the water supply to over 300,000 West Virginia residents. The Adya Claritysolution combined with the 0.45 microns filter paper reduced the MCHM concentration in the tap water by 99.9 % after 48 hours treatment. 4-methylcyclohexanemethanol (MCHM) is a chemical used to process coal. MCHM does not have explosive nor flammable properties. It is classified as an organic alcohol with an odor reported to smell like licorice. HOW DANGEROUS IS MCHM TO HUMANS? Unfortunately, information regarding the impact of MCHM to human health and the environment, either acute or chronic, is not fully known. Apparently, there are no human health studies. One study, owned by Eastman Chemical Company, where MCHM was tested on rats, is considered to be proprietary information and has not been released to the public. Founded in 2004, and based in Coldwater, Michigan, Adya, Inc. is the manufacturer of a revolutionary water purifying solution. This water purifying solution is a natural mineral salt complex which provides a safe and effective way to purify water. Adya’s products are distributed around the world through manufacturing facilities located in North America, Europe, and Africa. Adya, Inc. believes that clean and safe drinking water is a basic human right. They are committed to providing revolutionary, innovative and cost-effective products to not only provide clean and safe drinking water for humanity, but to clean Earth’s freshwater reserves to ensure the future of all life on Earth. On August 22, 2013, the California Department of Public Health issued a draft for the drinking water standard of 10 parts per billion pbb) for hexavalent chromium(also known as Hex 6, Chromium 6, and Cl6, and the contaminant made famous by the Erin Brockovich movie). 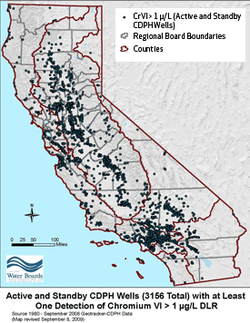 In 2001, the California State Legislature mandated that a drinking water standard for hexavalent chromium, be adopted by 2004. Nine years later, not only has the standard not been adopted, but the proposed standard has been adjusted from .02 pbb to a maximum contaminant level of 500 times higher than what California has determined safe to drink. This means that approximately 85% of the water sources contaminated by this dangerous carcinogen will NOT be treated, putting nearly 13 million of California residents at risk. Hexavalent chromium has been detected in 51 California counties with the following having the most detections: Fresno, Kern, Los Angeles, Monterey, Riverside, Sacramento, San Bernadino, San Joaquin, Santa Clara, Stanislaus, and Tulare. Adya's mineral solution converts Hexavalent Chromium to Trivalent Chromium. Trivalent Chromium is an essential nutrient. As a nutrient, trivalent chromium's most important role is it positively affects the metabolism of proteins, lipids, fats, sugars and carbohydrates. The daily suggested intake is 30 to 35 mgs for adult men and 20 to 25 mgs for adult women. Trivalent Chromium is neither toxic nor carcinogenic. Sources of trivalent chromium include whole-grain products and cereals, legumes, meats, yeast, coffee and spices. Dairy products contain low concentrations of trivalent chromium. According to the Environmental Working Group (EWG) when chlorine is used as a disinfectant to kill illness and disease causing microorganisms in contaminated source water, an unintended side effect is occurring. The chlorine is reacting with carbon-based waste and rotting organic materials like manure, dead animals and plants, and leaves, forming toxic chemical disinfection byproducts known as trihalomethanes. Although, the EPA referes to trihalomethanes as "probable" human carcinogen, they are considered to be a "known" carcinogen by California officials. The EWG refers to these byproducts as TOXIC TRASH. "This unintended side effect of chlorinating water to meet federal drinking water regulations creates a family of chemicals known as trihalomethanes. The Environmental Protection Agency lumps them under the euphemism “disinfection byproducts” but we call them what they are: toxic trash..
Scientists suspect that trihalomethanes in drinking water may cause thousands of cases of bladder cancer every year. These chemicals have also been linked to colon and rectal cancer, birth defects, low birth weight and miscarriage (NHDES 2006)." 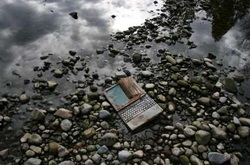 E-WASTE, the Newest Contributor to Water Contamination? In, 2009, there was an estimated 2.37million short tons of discarded cell phones, printers, scanners, fax machines, keyboards, computers, televisions, gaming accessories, mice, circuit boards, etc. Recycling our old electronic devices isn't just about "repurposing" or "reusing" plastic, wires, etc, it's about protecting our environment and human health. Electronic devices are made of a wide variety of composite materials. Some of the composites, such as lead, nickel, cadmium, mercury and brominated flame retardents, are hazardous to human and animal health and the environment. The EPA is very concerned about the proper management of used electronics and working to increase the implementation of collection and the recycling of used electronics. The EPA strongly supports keeping used electronics out of landfills. Recycling electronics recovers valuable materials and as a result, we reduce greenhouse gas emissions, save energy, save resources and reduce air and water pollution. Currently only 25 states in the U.S. have regulations for proper discarding of electronic devices. In 2003, the first state to implement a recycling program for electronic devices was California. Guiyu, China is a huge electronic waste processing area. It is referred to as the “e-waste capital of the world" with no regulations to protect the workers or the environment. Approximately 82% of children tested for lead contamination had blood-lead levels of more than 100. Anything above 100 is conisdered unsafe by health experts. The average test was 149. E-waste dumps can be found across the world in Asia, Africa and India. With amounts of e-waste growing rapidly each year urgent solutions are required. Dismantling and disposing of electronic waste can lead to a number of environmental impacts. Liquid and atmospheric releases end up in bodies of water, groundwater, soil and air and quite possibly in land and sea animals – both domestic and wild, in crops eaten by both animals and human, and in the air we breath and the water we drink.